To develop a concept (brand) for the external communication of NHS Bradford City and Bradford Districts Clinical Commissioning Groups (CCGs) Quality, Innovation, Productivity and Prevention (QIPP) programme. The project also involved creating several tailored messages to reflect different strands of the programme, with an overall message of how you can do more the help save the NHS. 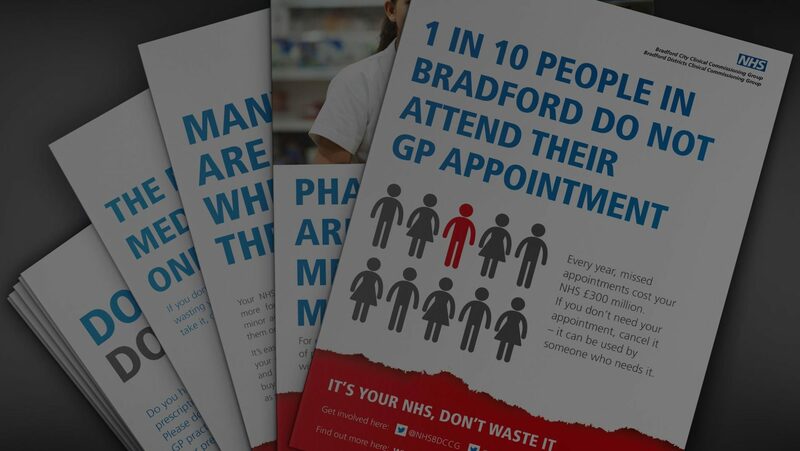 Successfully chosen due to the strength of the creative concepts that we developed, our approach was to work closely with the Communications team to ensure the development of several key messages that would eventually be displayed across all surgeries in the Bradford and Craven district. Our work fell into 2 main strands; Reducing medicine waste and using your NHS wisely. New campaigns were developed across print, web, media to ensure the message was placed on all potential customer touch points. Due to the success of the campaign, it was also rolled out by another CCG in Yorkshire.